Night had now approached, yet the tangible things I had seen made curiosity stronger than fear, so that I did not flee from the long moon-cast shadows that had daunted me when first I saw the nameless city. Order your own copy of The Forgotten Age at your local retailer or online through our website today! 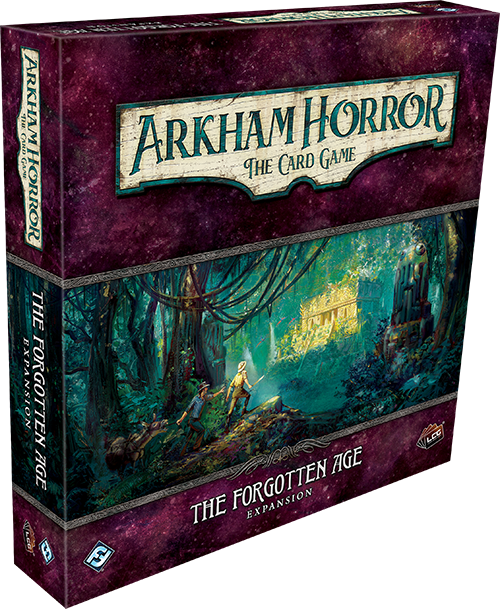 In The Forgotten Age, the third deluxe expansion for Arkham Horror: The Card Game, one to four player set out on an expedition in search of the ruins of an ancient Aztec city. This could be the discovery of a lifetime, but to even hope of reaching to forgotten metropolis, you will have to face untold dangers, including hazardous trails, poisonous serpents, and skilled warriors. To survive this perilous journey, you will need to fill your expedition team with the bravest and most cunning members you can find. 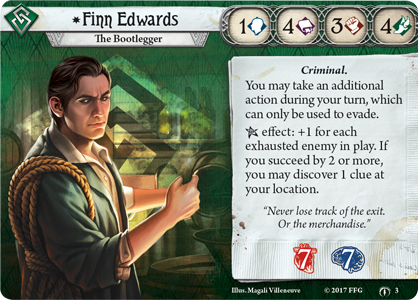 Today, we're pleased to introduce you to Leo Anderson and Finn Edwards, two of the investigators that you can add to your team with The Forgotten Age deluxe expansion! Leo Anderson (The Forgotten Age, 1) has spent his whole life getting into the deadliest and most obscure corners of the globe, and along the way, he’s lost good people. He often questions whether such academic pursuits have been worth the lives lost. He has seen men blinded to danger by an overwhelming desire to pull back the curtain and peek into the darkness beyond. His most recent expedition, an ill-fated voyage to Nan Madol to recover Olosopha’s Almanac, ended in complete disaster. Only one of his people survived, or at the very least, remained human. Leo is sick of burying people who trusted him. But now he knows these expeditions aren’t purely academic in nature. There's a greater purpose at work, and he won’t quit until the job is done. As both a Veteran and a Wayfarer, Mr. Anderson is a man whom others are willing to follow. After Leo’s turn begins, he may play an Ally asset as a free action, with their cost reduced by one. 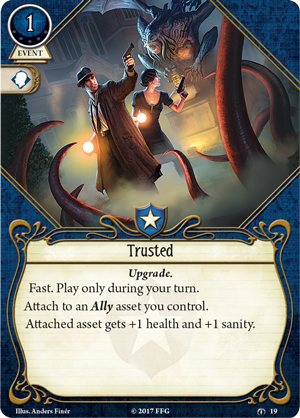 Then, when he discovers an elder sign token during a skill test, he may search the top three cards of his deck for an Ally asset and add it to his hand. Loyalty is the trait that Leo Anderson values most and any Trusted (The Forgotten Age, 19) Ally in his team would be safe under his direction, gaining increased health and sanity. But the most loyal friend and companion that Leo Anderson has ever found is Mitch Brown (The Forgotten Age, 6), the sole survivor of Leo’s last expedition. After what the two men experienced on their last maddening mission, Mitch refuses to leave his friend’s side, and his faith in Leo helps recruit many others to the cause. 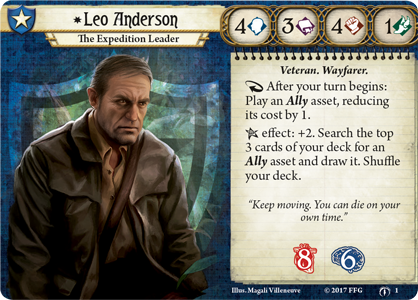 While Mitch Brown is in play, Leo Anderson gains two additional ally slots, though they can only be used to hold non-unique allies. If anything, Leo’s fatal Flaw is that his great discoveries always seem to be Bought in Blood (The Forgotten Age, 7). 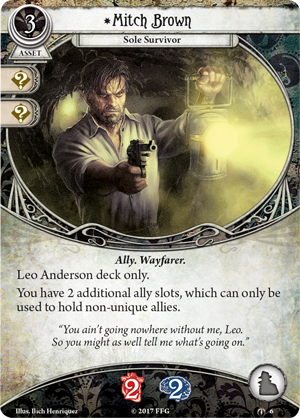 When this treachery is revealed, Leo must either discard one of his Ally assets from play, or, if he is particularly attached to those in his current team, he may discard every Ally from his hand in their place. 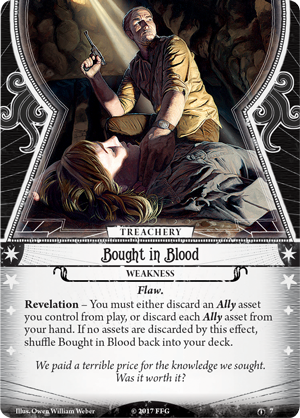 If no assets are discarded by this effect, Bought in Blood is simply shuffled back into Leo Anderson's deck. The devil must have his due. Prohibition was the best thing that ever happened to Finn Edwards (The Forgotten Age, 3). Until they banned booze, he was just drifting through life, odd jobs here and there. But afterward, the demand for alcohol rose to such a fever pitch that he was able to make a living evading the law and giving people what they wanted. His new lifestyle particularly suited his personality, providing him with a taste for danger and plenty of cash. He never got caught and never lost a delivery. Now he’s wrapped up in some kind of supernatural conspiracy, but in the end, he always adheres to two simple rules. Deliver the goods. Don’t get caught. Finn is not practiced in self-restraint, possessing a willpower of only one. But his high scores in both intellect and agility help keep him one step ahead of the authorities. 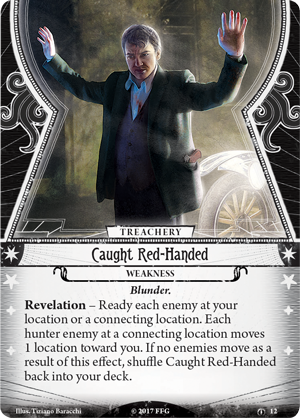 His necessity to keep out of reach of the law is reflected in his ability, which allows him to take an additional action during his turn that can only be used to evade an enemy. No matter how many people (or monsters) are on his track, Finn never loses track of the exit. Or the merchandise. Finn Edwards did not become the most successful bootlegger on the East Coast by being careless. Thus, his signature event, Smuggled Goods (The Forgotten Age, 10), can only be played if there are no ready enemies at Finn’s location. 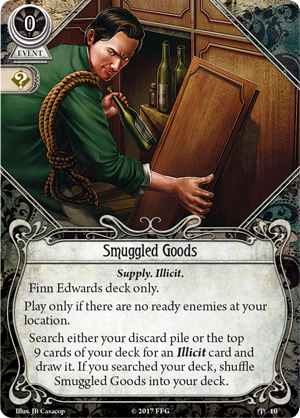 Once the coast is clear, Finn can use Smuggled Goods to search either his discard pile or the top nine cards of his deck for an Illicit card and draw it. When using this ability, searching the discard pile may be the sure thing, but taking a chance to search his deck has its own rewards. 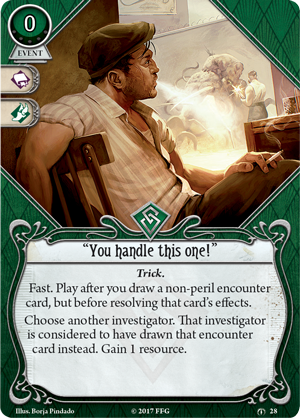 If you choose to search the deck, you can then shuffle Smuggled Goods back into your deck, providing the opportunity to earn an even greater profit later. When it comes to encounters with the law or vengeful Elder Gods, Finn is never one to put himself in harm’s way. In times of great distress, he is known to quickly maneuver out of danger, crying "You handle this one!" (The Forgotten Age, 28) to whomever is left behind. And, never wasting an opportunity, he uses the distraction for his own gain. After all, he doesn't need to be the fastest person in the group, just quicker than the person next to him. But in a rushed exit, Finn must be careful not to be Caught Red Handed (The Forgotten Age, 12), readying each nearby enemy and drawing each hunter enemy one space closer to him. Even if no enemies move from this effect, danger is never far behind as Caught Red-Handed is shuffled back into Finn’s deck. But Finn always has at least one trick up his sleeve. A true rogue, Finn gains a second unique item in the form of his concealed Weapon, Finn's Trusty .38 (The Forgotten Age, 11). With three ammo, this Illicit Firearm raises Finn's combat during to his fight actions. But the bootlegger has no illusions—he knows that he is no hero. The purpose of the weapon is to evade the danger, not increase it. 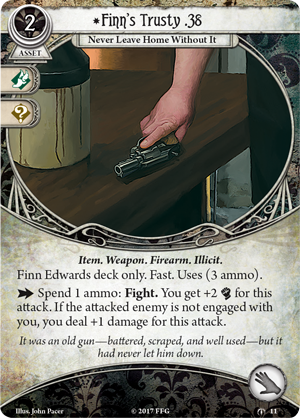 Not only does this weapon bear the Fast keyword, if the target of Finn’s attack is not engaged with him, the .38 deals additional damage. When working on the wrong side of the law, it's best to never leave home without it. 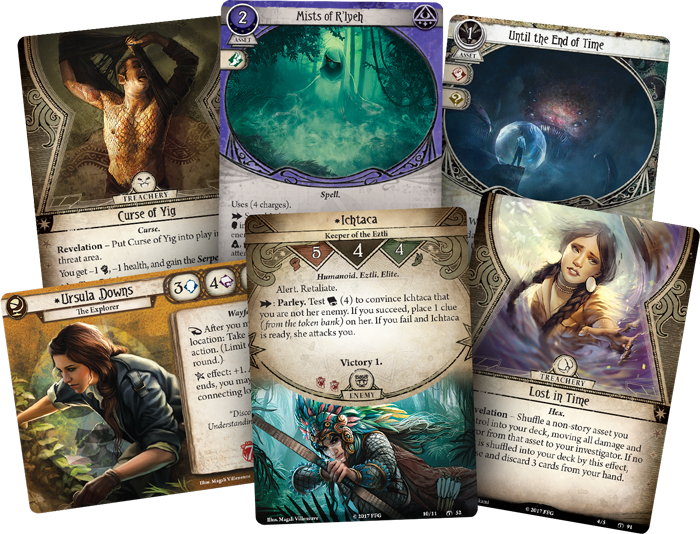 Prepare to embark on a scientific expedition unlike anything you’ve seen before in Arkham Horror: The Card Game. Whether you lead your team or stowaway beneath the decks is up to you. One thing is certain—this will be the adventure of a lifetime. Pre-order The Forgotten Age (AHC19) at your local retailer today or on the Fantasy Flight Games website here!